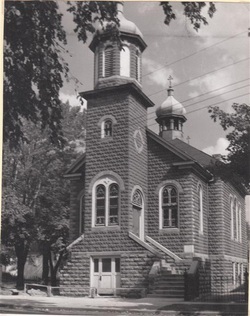 St. Nicholas Orthodox Church was founded on December 1, 1908. The missionary work and incentive to organize was started by Very Rev. Alexander Hotovitsky (now St Alexander, New-Martyr of Russia), Dean of the New York Cathedral. Fr Alexander came to Auburn on August 26, 1908 at the request of Thomas Garbinsky to perform funeral services for Mary Zanoviak. Spiritual needs of the Auburn faithful were tended to by Hieromonk Arseny, Abbot of St Tikhon Monastery, prior to the founding date. On December 4, 1908, land was purchased on the corners of Cross and Cottage Sts and religious services were first held in a small house on the premises that had been remodeled into a chapel. Fr Nicholas Duda was appointed Priest-in-Charge. In March 1909, Fr Joanniky Keyo (Kivko) was appointed as St Nicholas' first permanent rector. In June 1909, permission was granted by Archbishop Platon to build a church (1909 has been recognized as the anniversary date of the parish throughout the years). In addition to Thomas Garbinsky as President and Trustee, the first board included Basil Kimak, Joseph Pingryn, Gregory Maykovich, Halakton Melnick and George Brannick. Membership in 1910 was 49 families, 34 single adults, 15 children ages 7 and older and 69 children under age 7. Construction of the church cost $25,000. The cornerstone was laid on Novembre 25, 1909. The completed church was dedicated in a minor form on June 21, 1910 and pontifically consecrated by Bishop Alexander (Nemolovsky) in 1912. In 1913 an adjacent house was purchased for use as a rectory. The rector at this time was Fr Basil Bikoff. Other early rectors included Fr Dimitrius Kaminsky, Fr Andrew Vanyush, Fr Anthony Diachenko (1921-1935), and Fr Basil Oranovsky. In 1938, Archpriest John Yanchisin was appointed rector, serving with distinction as parish priest and for many years Dean of the New York State Deanery, until his passing away in 1962. Following World War II and the return of numerous veterans, a program was undertaken to enlarge the church, this work being completed in April, 1947. Membership peaked in 1948 with a total of 785 including children. Auburn, like many small industrial cities, has suffered through several decades of factory closings and lost jobs, creating downward population trends. Auburn at one time was larger than Syracuse, NY, and SS Peter and Paul Church in Syracuse is a daughter church of Auburn. Auburn's main employer today is Auburn Correctional Facility, a maximum security prison. Following Fr John's passing and burial in the parish cemetery (also purchased in 1909), Rectors to serve Auburn include Fr John Kozak, Fr George Cucura, Fr Daniel Geeza, Fr Vladimir Sovyrda, Fr Eugene Tarris, Fr John Lickwar and Fr Stephen Mack (the current rector). In the past 40 years much work has been done to beautify the church interior. Large icons of the four Evangelists, St Nicholas, and Christ Enthroned adorn the church proper, and a large icon of the Theotokos adorns the ceiling in the Altar. Life-sized icons of Church Fathers were added in 1987. Many of the stained glass windows pre-date the church (1880s). In addition, a new rectory was completed in 1972. Two seminary graduates have come from Auburn: John Sopchak from St Vladimir's and Tom Bushallow from St Tikhons, both in the 1950s. Two ordinations of deacons have taken place in Auburn: Protodeacon Michael Speck and Deacon Anthony Lupo, both ordained by Archbishop Peter of New York. Neal Yanchisin, son of the late Mitred Archpriest John and Matushkas Anna Yanchisin.